A collection of Valcooks "plum bodacious" recipes as featured on American Legacy Network's "Valcooks Kitchen" on its Lifestyle Channel. Interactive cookbook. Follow recipes, then view 1 - 2 minute cooking videos using QR Reader app with subscription to ALN. Recipes includes Valcooks favorites - Paella, Shrimp Beignets, Crab Shalla, Homemade Chicken Noodle Soup, Candied Yams, Banana Pudding and more..
Valcooks, LLC was founded in 2008, by Valerie Wilson Reed, (aka Valcooks) from her love of cooking and entertaining. Valcooks produces culinary videos for her cooking channel, "Valcooks Kitchen" which is currently featured on American Legacy Networks' Lifestyle channel. 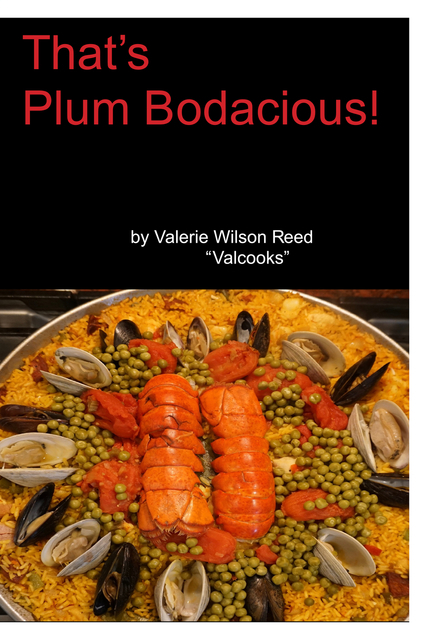 Valcooks' first cookbook, "That's Plum Bodacious", is a compilation of those recipes. Valcooks Coffee, which markets its own private reserve products online, is an subsidiary of Valcooks, LLC.. Valcooks, LLC formerly manufactured a line of designer hostess aprons, which within one year, was sold on Home Shopping Network (HLN) and was featured on the nationally syndicated NBC television's "1st Look".